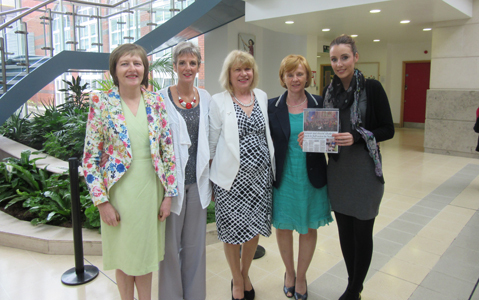 Christina O’Connell, Pauline Byrne, Veronica Murphy and Phyl Conway-Behan all visited St. James’s Hospital recently to present a cheque for €5,000 to the hospital for cancer research. They are all members of the Big C Choir, a group of cancer survivors, cancer patients and their friends and family. This generous donation was raised at a concert they held earlier this year at the Parish Church of Our Lady and St. David in Naas, Co Kildare. “We want to show others that you can get on with your life after cancer”, Christina O’Connell explained. The Choir puts a huge amount of effort into their annual concerts, from raffle prize sourcing to designing posters and tickets; they want each concert to be an enjoyable experience for everyone involved – singers and the audience – to celebrate life, raise awareness and fight cancer through raising funds for research. The Big C Choir will host their fourth annual concert next April at the Church of Our Lady in Blessington, Co Wicklow. For more information on concert dates, please see the Big C’s Facebook page here or if you would like to join the choir, you can contact Christina on 087 054 7213 for further details. St. James’s Hospital is the largest single provider of cancer treatment in Ireland and is the largest national centre for radiotherapy service. A major government funded Cancer Care Centre and Radiation Oncology Centre is based on the site and a facility for PET imaging for advanced patient diagnosis is open – the first such facility within a public hospital in Ireland.